Sturgeon Bay in Door County has recently been named the number one bass fishing destination in the country and rightfully so due to our tremendous Smallmouth Bass fishery. Door County smallmouth bass fishing is so good for many different reasons one of them being miles and miles of fantastic habitat along with a rich forage base which helps the fish grow big and also a very large body of water for the fish to live in. 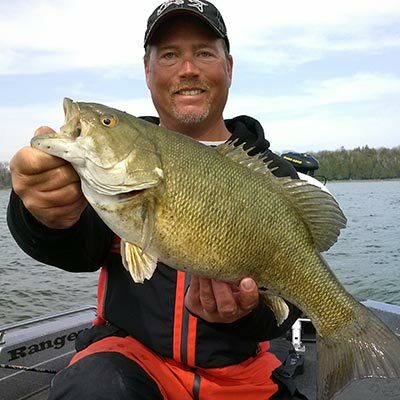 In the spring of the year as the water slowly begins to warm the Door County smallmouth bass will begin to move into the backs of some of the bays seeking out the warmest water that they can find and begin to feed up before they fin ally spawn. When fishing for Door County Smallmouth Bass it is usually done with a casting approach which can consist of casting soft plastics such as grubs, tubes, or suspending jerk baits. As summer approaches and the fish have finished up their spawning they will once again begin to feed up to regain some much lost energy they used up during the spawn. Fish will begin to move into some of their summer haunts which include mid lake reefs along with some of the island areas. In these areas you can expect to find success using baits such as tubes, spinner baits along with some top water action. During the fall season the Door County Smallmouth Bass will relate to areas that will be close to where they will winter over in and really begin to put the fall feed bag on. During the fall you will generally find the Door County Smallmouth Bass in deeper water than you would have found them in spring or summer. In fall I generally like to use bigger baits than I would have been using in summer the fish want to get as much as they can for the least amount of energy. Late Eyes Sport Fishing uses a Ranger 621 boat powered by Evinrude with all the appropriate navigation equipment, Lowrance GPS with mapping chips, Raymarine VHS radio and Lowrance fish locators.